From the versatility of the latest control technology to the comfort and operability delivered by our ergonomically designed operator compartment, Toyota’s 7FBE redefines 3-wheel electric forklift quality and productivity. Just look at a sampling of the manoeuvrability, reliability/durability and easy service access features our 3-wheel electrics offer. It’s easy to see that these dynamos were designed with you in mind. 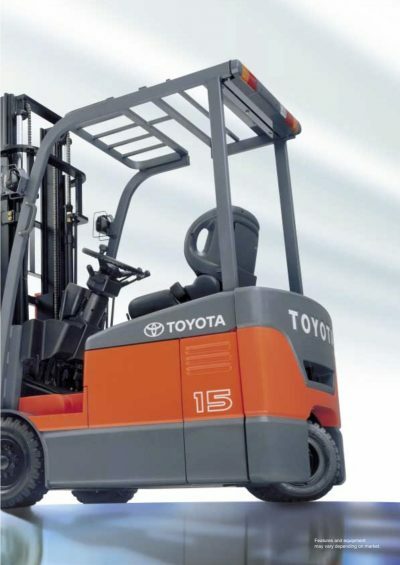 Our 7FBE forklifts combine the proven performance, reliability and operability of Alternating Current (AC) Power technology. Operator comfort is key with improved visibility and ease of service. Excellent travelling and lifting speeds.